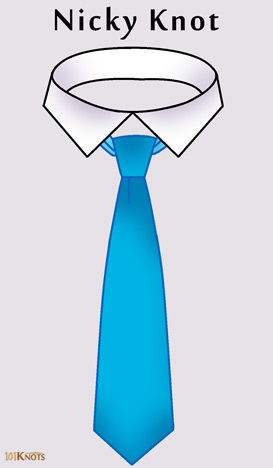 The versatile Nicky tie knot is a variant of the more symmetrical Pratt knot. Its size lies midway between the four-in-hand and half-Windsor knots. 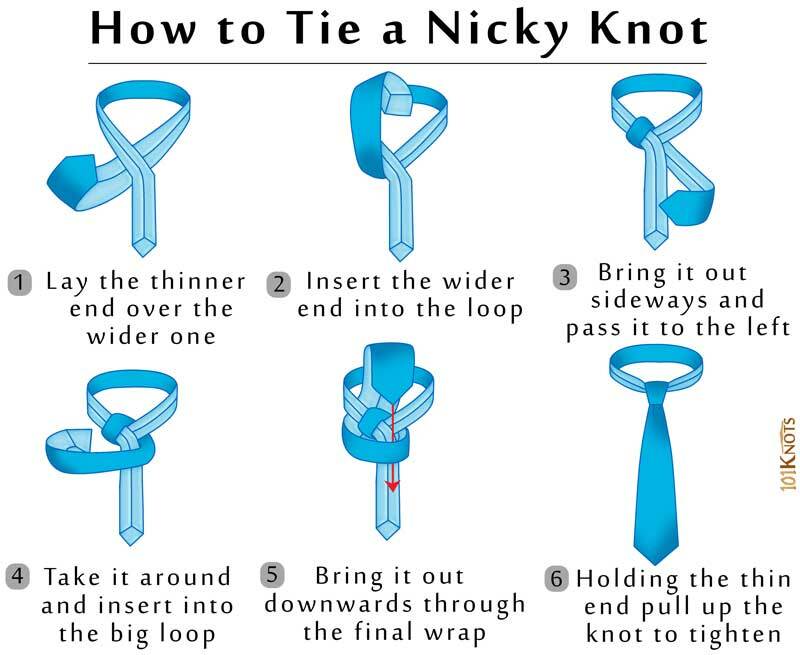 In other words, it is larger than the four-in-hand but smaller than the half-Windsor making it a relatively big knot. It owes its name to the middle-Eastern tie maker Nicky and was invented by Ernesto Curami. Though initially less known outside Italy, it gained wide recognition after being rediscovered by David Kelsall who reported it as an improvement over the Pratt knot in The Sunday Telegraph in 1991. Start by wrapping the tie around your neck with its seam side up for both the thin and wide ends. The thinner end should be about a hand and a half above the waistband before starting with the first step. In the last step be cautious about forming the small dimple at the center just below the knot for a classy finish. It suits thin, medium-thick and thick ties. Choose medium spread to slightly cutaway collars for the best looks of the tie. Avoid pairing it with a widely spread collar since it reveals the loop of the tie from the sides that is undesirable. A classic collar is not suitable as being very narrow it may obscure the knot partly from view. Do not wear it with collar pins, tab collars or bars since it is fairly large. They suit Oriental and four-in-hand knots. Can also be made with wool neckties without creating a lot of bulk.